People often ask me how Twist Yoga came to be. The chance of a less-than-flexible mom in her mid-40s, who is not a yoga teacher, was born and raised in Miami, has a background in the so-not-yogic financial services industry, and has never owned a business before, opening a yoga studio in Oregon, is probably fairly slim. Heck, I never even practiced yoga until 10 years ago. And, anyone who has been on the mat next to me knows that the adjective “bendy” has not, nor ever will, describe me. But, alas, here we are getting ready to celebrate five years! My kids were getting older and I felt the pull to open a small business in my community — I just had no idea what it would be. I’d never worked in retail — well, except for those 3 months after college in Miami in 1991 when I worked at a Victoria’s Secret because my parents claimed, “You gotta have a job to get a job.” Plus, they were charging me rent to live at home after graduation. I just needed a little time to make that advertising and English major pay off! When Mark and I moved to Oregon the year Carter was born, 2003, I was staying home with the kids for the first time after leaving an amazing career in financial printing in Atlanta, Georgia.Soon though, I got restless and was ready to get back into the workforce. I was incredibly inspired by some totally kickass entrepreneur friends who were the OG mom-preneuers! I was drawn to the dream of opening a place close to our home where people could come to connect and feel a little bit happier when they left. I just didn’t know what I’d “sell” there to pay the bills. After years of forcing my “tin-man” body to try yoga at 24 Hour Fitness and hating every minute of it because I wasn’t “good” at it, I finally discovered some styles of yoga that I felt were a physical exercise I could do the rest of my life.I finally felt like I was making my body and my mind stronger with exercise, instead of tearing it down all the time. But, I was driving all over kingdom-come to far-away studios, so I was still searching. 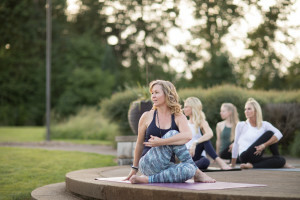 It’s hard to believe that up until 2012, there were no yoga studios in Lake Oswego, Tigard, West Linn, or Tualatin. It was a yoga desert. I literally had a yoga carpool of my friends that would drive to class like we were commuting to work.Now, I don’t have a yoga background, but I do understand the laws of supply and demand.Why wouldn’t someone open a studio in LO?There must be a reason. You should also know that I (virtually) create new products, and start new businesses like most people change their minds. The problem is, I never actually ‘start” them. I always have a new/bigger/better/revolutionary idea. My family is used to it and takes them all with a grain of salt. In my head, I have founded a digital tooth fairy stuffed animal, a peanut butter storage tube, and a design company that gives you a picture of what your rescue dog would look like as a puppy. I binge Shark Tank like you binge Game of Thrones. Thankfully, this one stuck. By the end of that practice, I had talked myself back into it. I would open a yoga studio. I came home and told Mark that I was opening a yoga studio. He replied with his much-practiced support— which is easy to do since it never really has to come to fruition. But, this time felt different. I started in on a business plan because that’s what you did in the ol’ days. I started talking to anyone that had a small business, and tried to understand the expenses, the risks (holy crap! ), the capital, and the tax and legal implications. Let me admit this, too. I had never really used Excel before. I kid you not — I thought you had to use your calculator to do all the calculations and then put them into each box. I’m not kidding. Mark was looking at one of my projected expense spreadsheets (and I use that term loosely), and asked why the “formulas” didn’t work. What? Yeh, blonde moment, for sure. Now, Excel is my BFF and rock that formula sh*t like a beast. At a cocktail party in early 2013, I blurted it out. “I’m going to open a yoga studio in Lake Oswego.” I saw Mark’s eyes get wide from across the room. There, I’d said it. No turning back, right? "You aren't a yoga teacher, there's no way you can own a yoga studio"
Once I spoke it, everything else seemed to fall into place. Even though I was told by many that "You aren't a yoga teacher, there's no way you can own a yoga studio", I forged on. I decided I could hire the VERY BEST teachers in town and let create their magic in the practice room, and I'd work behind the scenes running the business. It worked. We found the right location, and one night after a lot of soul searching and a bit of liquid courage, we signed a five-year lease. Now, five years later, another lease negotiation is afoot. But, this time, it’s all different. No second guesses. And you should see the Excel spreadsheets!